The famous monoi with the bearded gyoji was a bout between Tochinishiki and Kitanonada during the aki basho 1958 (if I remember correctly). It's Hara Tatsunori, an ex-baseball player and manager. He is a legend of the Yomiuri Giants. It should be Umegatani II, but I'm not very sure. For example, you could add to your list Ryûkôzan in earlies 1990's, the 32nd yokozuna Tamanishiki in late 1930's or the great hope Okitsuumi in 1933. If I remember correctly, Wakanosato and Takamisakari don't come from the same town. Takamisakari raised at Itayanagi, and Wakanosato, at Hirosaki. These town are very close, but not the same. I'm sad to know that Chiyohayate's career is over. He was very serious during keiko, fast and big heart rikishi. Good luck to him ! I guess that the two yokozuna are Nishinoumi II and Otori. I wonder who he is, that is if intended to be anyone in particular. Hokusai wave is on this kesho mawashi that I found in a search although I have no idea who it belonged to. I think that this set belonged to Chiyonoyama. 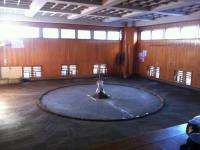 Chiyonofuji used a very similar's one for his first yokozuna dohyo-iri. The rikishi on the right during sanyaku soroi-bumi is Daikirin. Actually, I prefer Myogiryu's position. Are you guessing or posting news? Sorry, just guessing ! For what it's worth, the reports immediately post-intai included comments from him that he wants to be a very hands-on coaching oyakata, i.e. regularly getting into mawashi for keiko, not just sitting on the sidelines. That indicates to me that he probably still has designs on setting up his own stable. His father-in-law always seemed like a pretty diligent man when he was in Kyokai management, so it wouldn't surprise me if the details of that branch-out/re-establishment were already hammered out back when the original Oshima-beya folded - I doubt Tomozuna-oyakata will be able to block that move. (I probably should have moved my initial reply to the Tenho intai thread...this is getting pretty off-topic here. :-S) The new Oshima oyakata would wait june 2017. At this time, Tomozuna oyakata will quit the NSK. Good news indeed about Kyokutaisei. Do you know if new Oshima oyakata will re-open the heya ? Shodai's promotion should be a freshness wind for Tokitsukaze-beya. The rikishi on the left is yokozuna Haguroyama. On the right, I think it's yokozuna Azumafuji (or maybe Terukuni). Futagoyama oyakata lost some weight! He looks genki.